HOUSTON (AP) — The arrest of a Border Patrol supervisor on allegations that he killed four women calls new attention to the agency’s problems keeping rogue officers off its force as it faces intense pressure to hire thousands more agents. Juan David Ortiz, who worked in the agency’s Laredo sector, is accused of targeting women believed to be prostitutes in what prosecutors say is the work of a serial killer. The Border Patrol and prosecutors portrayed Ortiz as an outlier who is not representative of the thousands of employees working for the agency around the country. “I would hate for this to tarnish the great work that those men and women do,” Border Patrol chief Carla Provost said at a news conference alongside prosecutors and other law enforcement officials. But Ortiz’s arrest and allegations of violence involving other Border Patrol agents have thrown a spotlight on how the agency vets prospective hires at a time when President Donald Trump wants to bring on 5,000 more agents as part of his crackdown on illegal immigration. Congress has not funded the request. The Border Patrol has struggled for many years to hire enough agents. Many jobs on the force require living in remote desert towns along the U.S.-Mexico border. Agents must pass a detailed background investigation, and the polygraph exam that’s been required of all applicants since 2012 is a major barrier, with just a 28 percent pass rate between 2013 and 2016. Rep. Henry Cuellar, a Democrat from Laredo, said Monday that he was weighing whether the agency should consider requiring a psychological examination for all new officers. He said he also spoke to agency leaders Sunday about adding more internal affairs officers. Cuellar is a member of the House subcommittee that reviews the budget for the Customs and Border Protection division of the Department of Homeland Security. Ortiz is a 35-year-old Navy veteran who joined the Border Patrol in 2009, around the time of the last major hiring surge at the agency. The agency has grown dramatically over the last 20 years, from about 8,000 agents in 1998 to around 20,000 today. There are roughly 1,700 agents in the Laredo sector, which is west of the Rio Grande Valley, the nation’s busiest corridor for unauthorized border crossings. As the force grew, so did arrests for misconduct. The Government Accountability Office found that 336 employees of CBP were arrested in fiscal year 2012, compared with 190 arrests in 2005. The average rate of misconduct rose slightly from 2005 to 2012, from 4.5 to 5.6 arrests per 1,000 employees. “We’re still suffering through the results of that last hiring surge,” said Cynthia Pompa, advocacy manager at the American Civil Liberties Union’s Border Rights Center. Ortiz was the second Laredo agent to be accused of murder this year. Ronald Anthony Burgos-Aviles, another supervisory agent, was arrested in April and charged with capital murder on allegations that he killed a 27-year-old woman with whom he was romantically involved, as well as their 1-year-old son. Prosecutors are seeking the death penalty. The same sector also drew attention in May after the Border Patrol changed its story about why an agent shot and killed a 19-year-old Guatemalan woman, Claudia Gomez Gonzalez, who had crossed the border near Laredo. Officials initially claimed the agent had been attacked “by multiple subjects using blunt objects,” only to revise that statement two days later and remove the claim. Pompa, who is based in the Texas border city of El Paso, said it was “extremely alarming” that agents with the power to stop and question people in border communities had been accused of crimes such as murder. “Many residents along the Southwest border don’t trust these immigration agencies, particularly the Border Patrol,” she said. 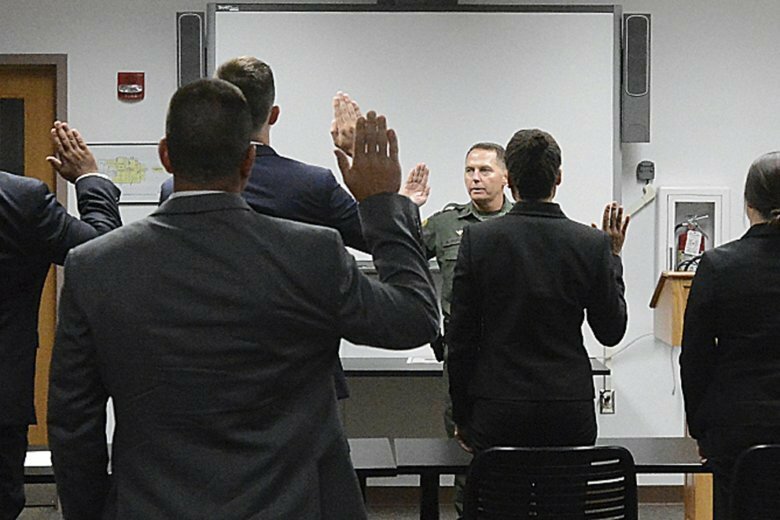 Recruiting the military is central to the Border Patrol’s hiring strategy. It gives preference to veterans and offers soldiers an expedited hiring process, including waiving the polygraph exam and fitness tests that allows them to be hired in about three months. Ortiz left the Navy in May 2009 after an eight-year career in which he served as a combat medic. A law enforcement official told The Associated Press that Ortiz officially joined the agency on Aug. 27, 2009. The official spoke on condition of anonymity because the person was not authorized to speak publicly. Provost told reporters Monday that Ortiz had been placed on an indefinite, unpaid suspension, and that her agency was cooperating with investigators. Associated Press writers Juan A. Lozano in Houston, Colleen Long and Robert Burns in Washington, and Larry Fenn in New York contributed to this report.